A former sub-postmistress from County Tyrone who was accused of stealing thousands of pounds from her own post office insists she is innocent. 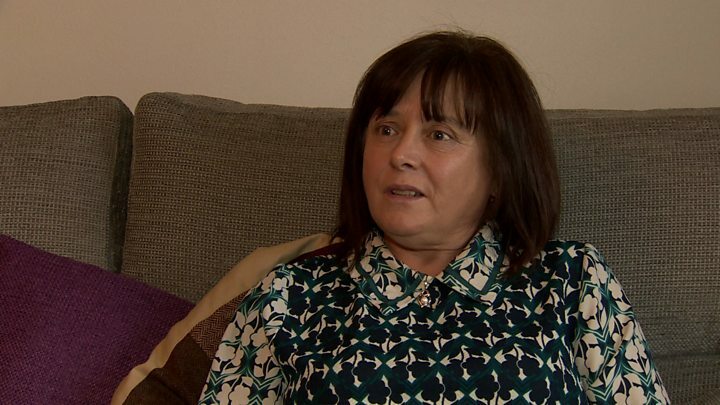 Deirdre Connolly, 49, is one of more than 550 former post office staff across the UK taking a group action against Post Office Ltd.
She said she wrongly had to repay £16,000. It happened after a computer system showed a non-existent shortfall at Killeter post office, which she ran. While declining to comment on individual cases, the Post Office said its computer system, known as Horizon is reliable. It will be "robustly defending its position" when the group action questioning the reliability of the system goes to court next year, it added. Mrs Connolly was forced to pay back the money after the computer in the Killeter post office branch showed a deficit in 2010. "There was an audit and I was told there was a discrepancy of £16,000," she said. "I was totally shocked - I did not know what had happened or what to do, it was an awful experience. "I was put out of the post office and had to hand the keys back that day - I had to go for interview to a fraud investigator in Omagh. "He asked me did I steal the money, which I did not. "Categorically, I did not steal the money." Mrs Connolly is not connected to the current branch of the post office in Killeter. She blames problems with the Horizon computer system used by Post Office Ltd, believing it generated a discrepancy between the business transacted and what was in the till. A former sub postmistress at nearby Clady post office in Tyrone said she also encountered problems with the Horizon computer system. Fiona Elliott ran the branch from 2004 to 2009 - it was attached to a convenience store. "At the end of the night, it was telling me that I had maybe minus £80, minus £100 or maybe £120 down," she said. "So I would have gone over to the shop counter, taken the money out of the till and put it into the post office counter so that things would balance up for us. "Altogether I put £8,500 out of my own money into the post office. "If the computer system had been balancing properly, I would not have had to put my own money into it. "This left the shop side of the business struggling so we ended up selling the whole business." Mrs Connolly, who now lives in Strabane, said the entire episode at Killeter post office cost her her livelihood, health and reputation. "The business was affected - people stopped coming into the shop and business fell away. "The debts mounted and we were not able to pay them. "We were made bankrupt. Then I took epilepsy. "All I want out of this is to clear my name so that I can hold my head up high and just walk up Killeter Street and not think people are looking at me as the person who took £16,000 out of their local post office, which I didn't." The group legal action against Post Office Ltd, which will focus on technical matters concerning the Horizon computer system, is scheduled for March 2019. There are 557 claimants, with individual complaints spanning the past two decades. Post Office Ltd declined to comment on specific cases but said it would be "robustly defending its position in the court". "We take these cases extremely seriously and we have worked hard over a number of years to address the issues raised. "We have conducted thorough investigations and sought to resolve some of the claims through mediation," said a spokesperson. "It's important to note that the claimants represent a very small proportion of users of our Horizon computer system users since 2000. "We have confidence in our network of 11,500 post office branches and the systems underpinning it. There are 485 post office branches in Northern Ireland. Fujitsu, the company that developed the Horizon computer system, said it had no comment to add to what Post Office Ltd had already said.